This is a stunning new piece of meteorite jewellery. 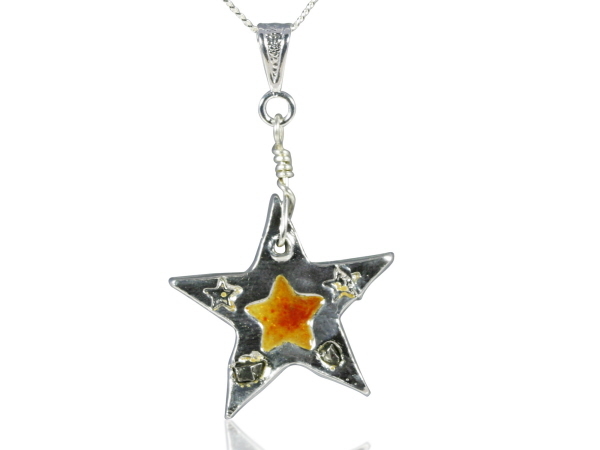 I have made a solid silver star set with fragments of iron meteorite - and topped it off with a fiery enamelled star in the centre. There are also some tiny embossed stars set into the star itself. Boxed and Labelled - and beautifully packaged as usual complete with signed certificate of authenticity complete with holographic serial number and A4 meteorite information sheet. THE ULTIMATE GIFT FOR ANY ASTRONOMY FAN!